We aren't going to provide press coverage for the Family Circle Cup (beginning April 4) this year or have prize drawings and handouts, but we are going the last few days, hopefully to simply relax and enjoy some great tennis. Perhaps, we may provide a few blog posts or a few tweets while we're there. 1. 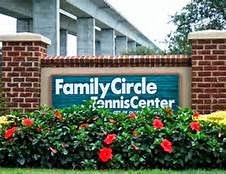 Family Circle Tennis Center is a wonderful facility. No, it's not Billy Jean King National Tennis Center. It's homier and there is usually plenty to enjoy, see or do while matches aren't underway. The event and facility staffs are fantastic and helpful. There are a vast number of national and local vendors there, tennis-related and otherwise. Also, because this is not a monster of a stadium, even the highest seats are good seats. 2. Daniel Island is a beautiful community and you don't have to go far for some fantastic food; vistas of rivers, creeks and marshlands; or to perhaps find your next home. 3. Charleston is within view of Daniel Island and is only a 10 to 15 minute drive away. Voted one of the top U.S. cities to visit for many years, its history, architecture and style of living is not all there is to take in. There are usually some local events beginning this time of year aside from all the fantastic shopping, not to mention that Charleston has received high regard from the culinary industry nationally and beyond. Also, there are beaches east and south of Charleston and plenty of water sports to partake. 4. There is much history behind Family Circle Cup and is the largest women's only tournament of the year. Andrea Petkovic is back to defend her title from last year and although there is obviously only one singles and doubles winner, almost every player has said they enjoy the tournament, the atmosphere and the people. So, if you haven't made plans to go the Family Circle Cup, do so. The links above should help you in discovering what you need to know. And, we'll be providing some posts over the next several days to highlight some items you may find interesting. Save Money on Just About Everything!